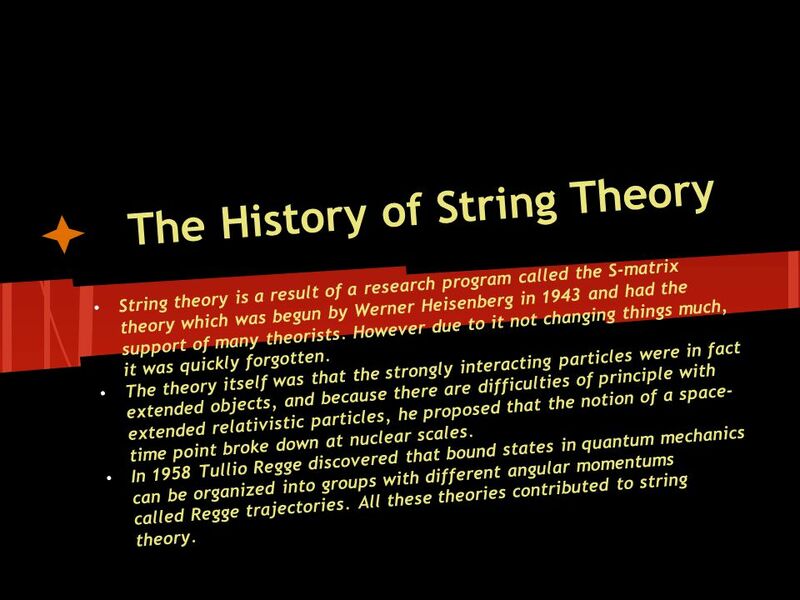 String Theory. 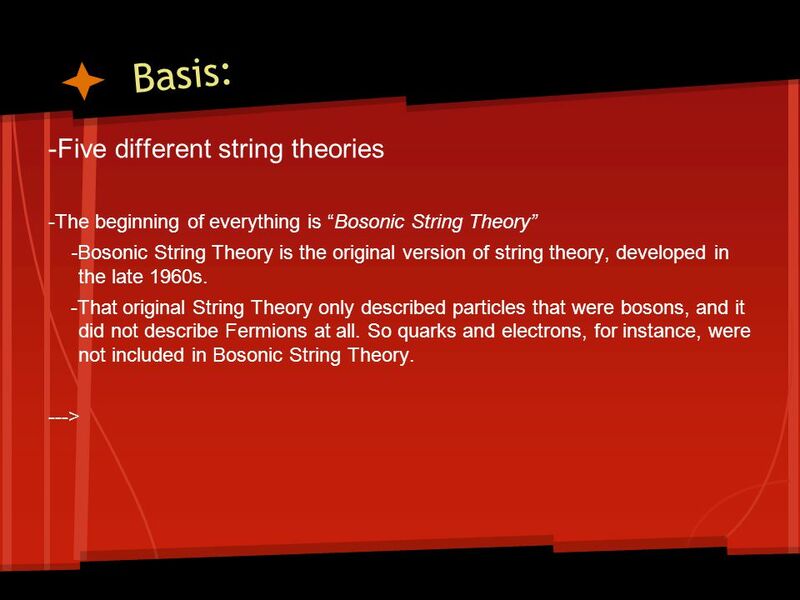 What it’s all about The Basics String theory is an attempt at understanding how the universe works: both what it’s made of and how it behaves. 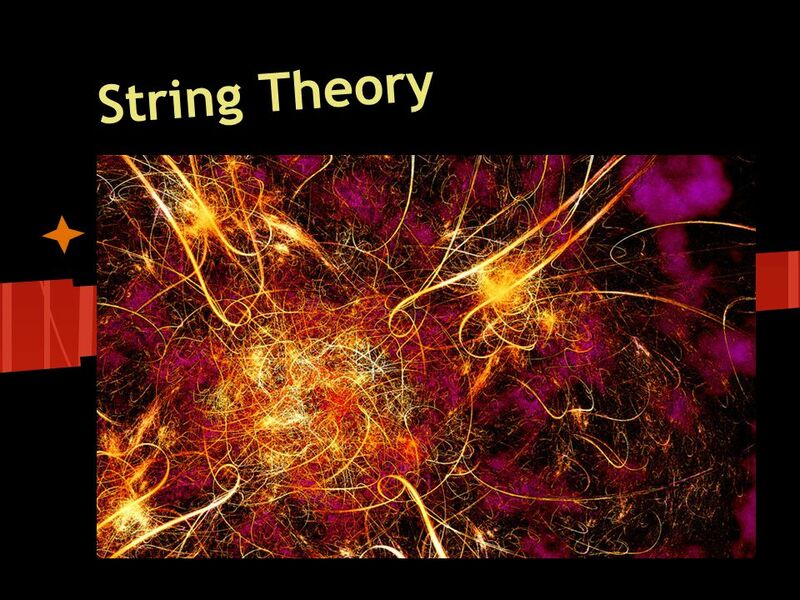 2 What it’s all about The Basics String theory is an attempt at understanding how the universe works: both what it’s made of and how it behaves. The very basic idea is that particles aren’t points, but instead stretched strings. The strings can either be closed, like a ring, or open. o This along with the way they vibrate give them their traits, making electrons different from muons, for example. 4 Why isn’t this in textbooks? 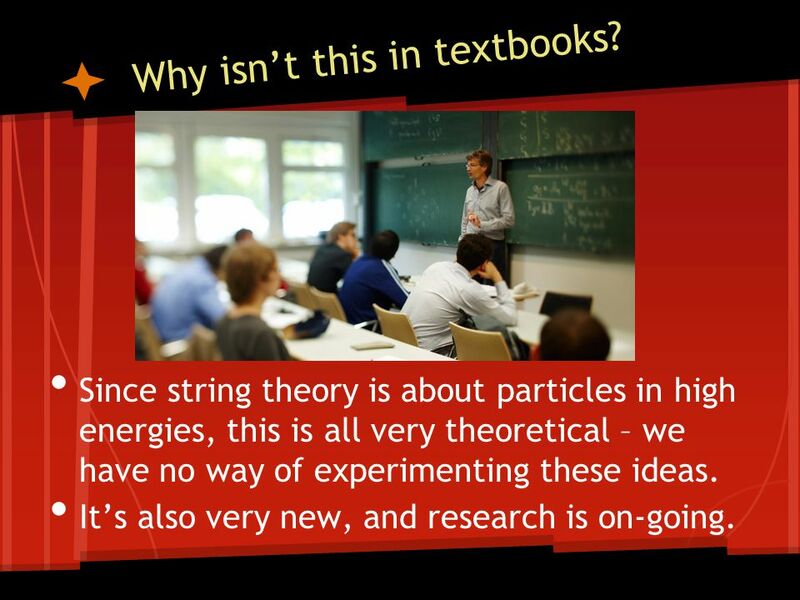 Since string theory is about particles in high energies, this is all very theoretical – we have no way of experimenting these ideas. It’s also very new, and research is on-going. 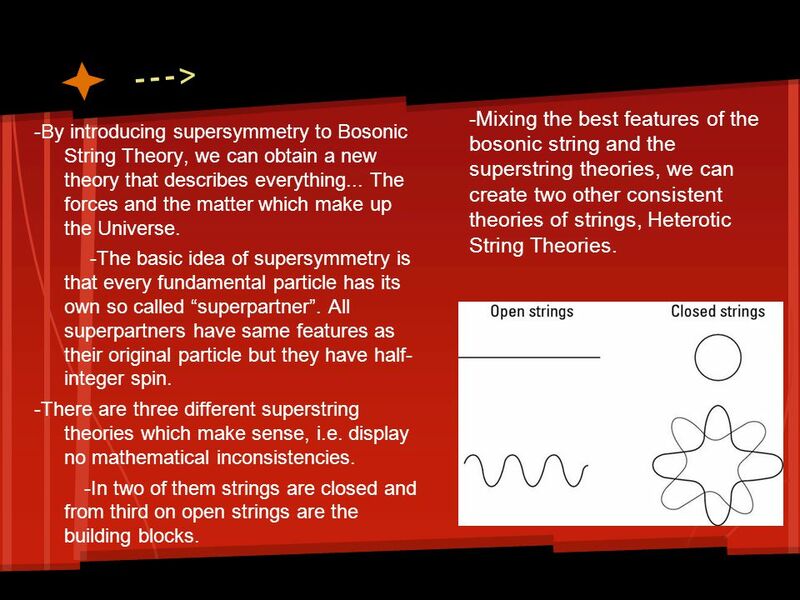 13 -By introducing supersymmetry to Bosonic String Theory, we can obtain a new theory that describes everything... The forces and the matter which make up the Universe. -The basic idea of supersymmetry is that every fundamental particle has its own so called “superpartner”. All superpartners have same features as their original particle but they have half- integer spin. 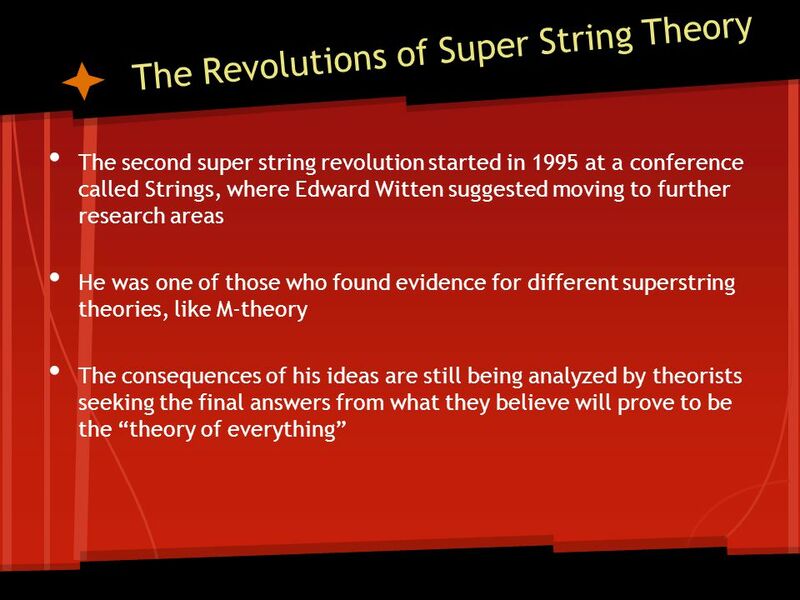 -There are three different superstring theories which make sense, i.e. display no mathematical inconsistencies. -In two of them strings are closed and from third on open strings are the building blocks. 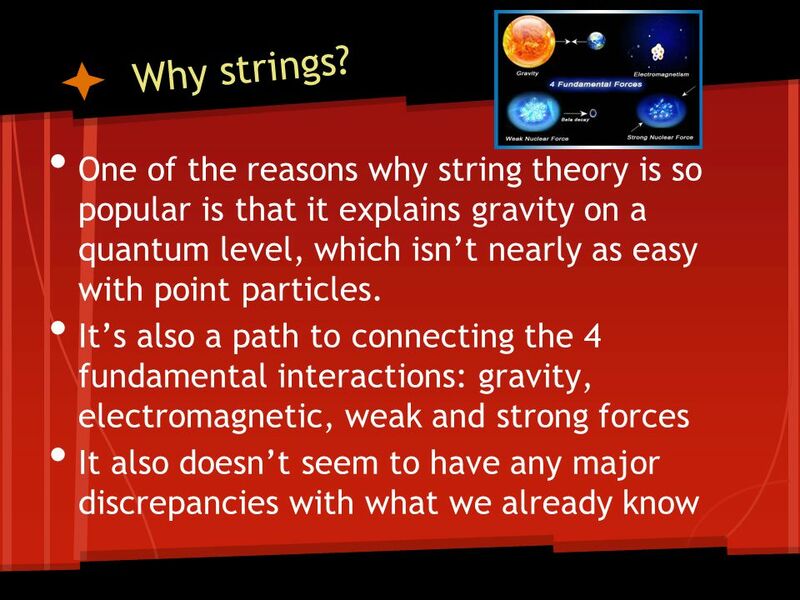 -Mixing the best features of the bosonic string and the superstring theories, we can create two other consistent theories of strings, Heterotic String Theories. 14 Dimensions The basic assumption is that we obviously have only three dimensions of space and one of time. However, if we assume that six of these dimensions are curled up very tightly, then we may never be aware of their existence. 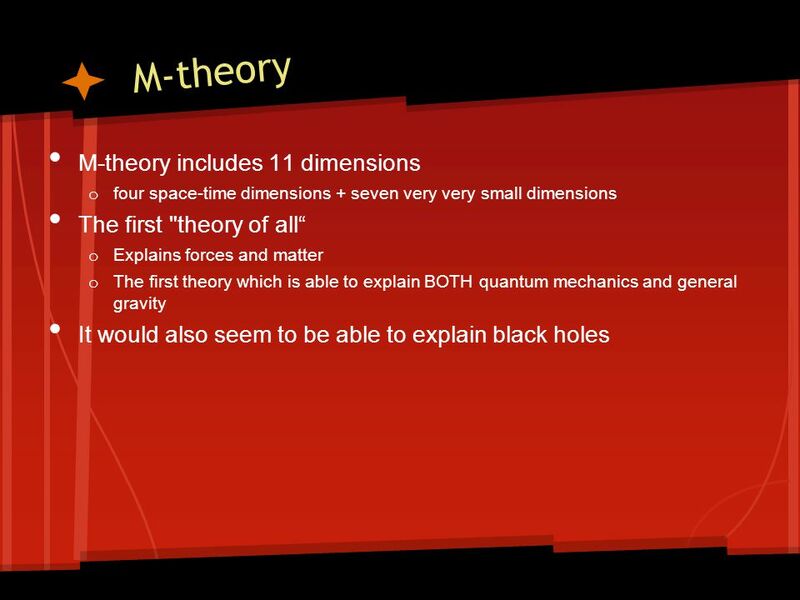 But one of the most remarkable predictions of String Theory is that space-time has ten dimensions! 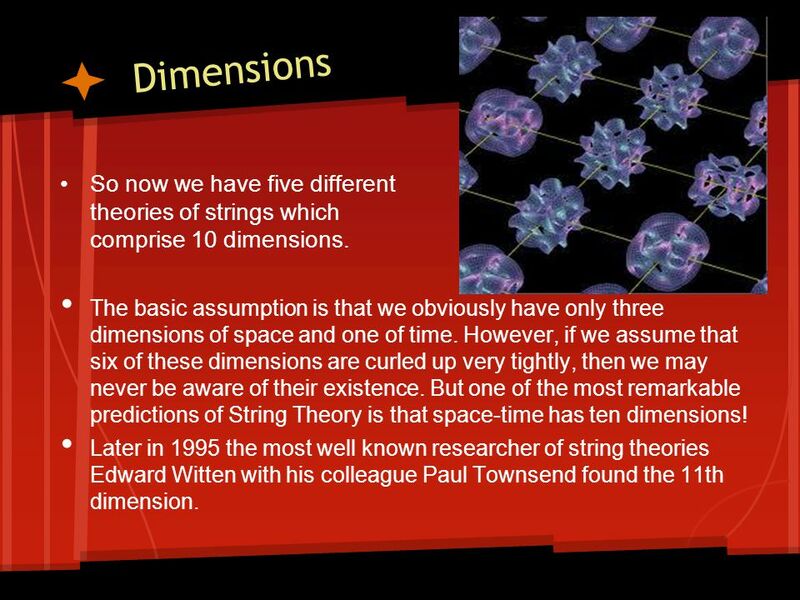 Later in 1995 the most well known researcher of string theories Edward Witten with his colleague Paul Townsend found the 11th dimension. 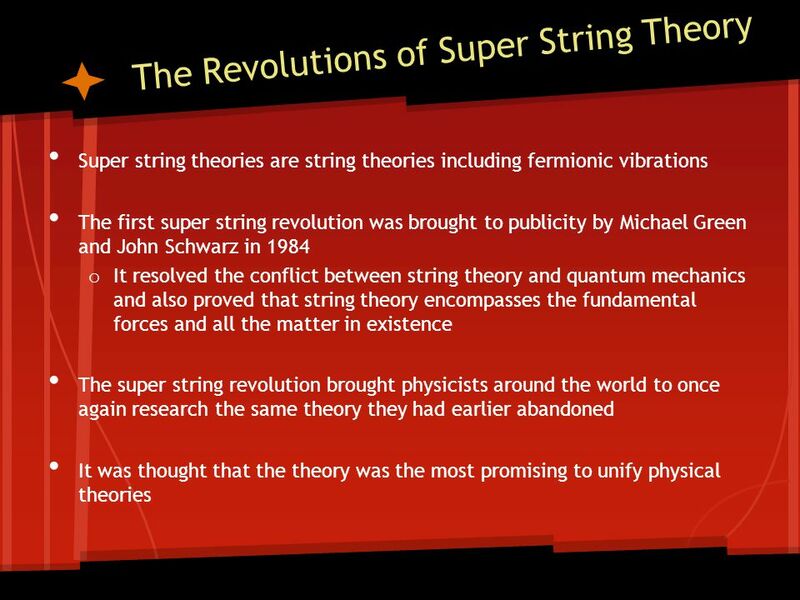 So now we have five different theories of strings which comprise 10 dimensions. 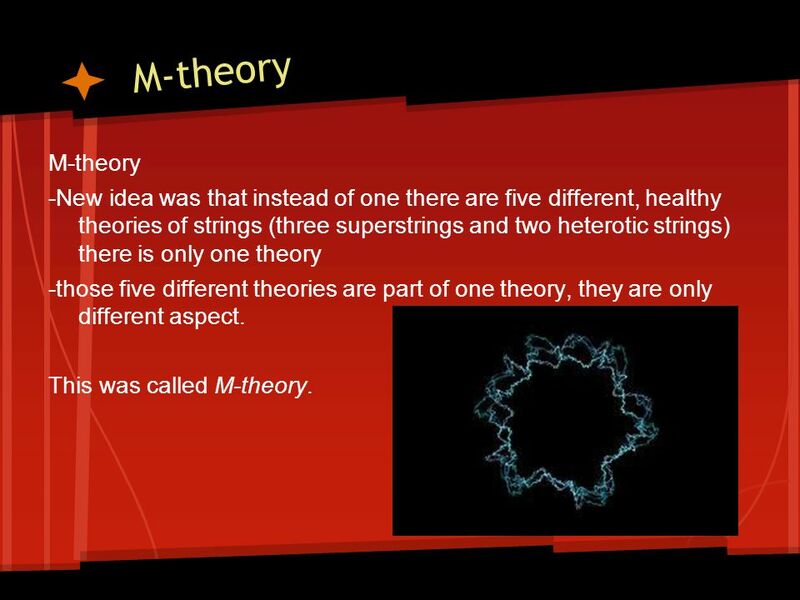 15 M-theory -New idea was that instead of one there are five different, healthy theories of strings (three superstrings and two heterotic strings) there is only one theory -those five different theories are part of one theory, they are only different aspect. 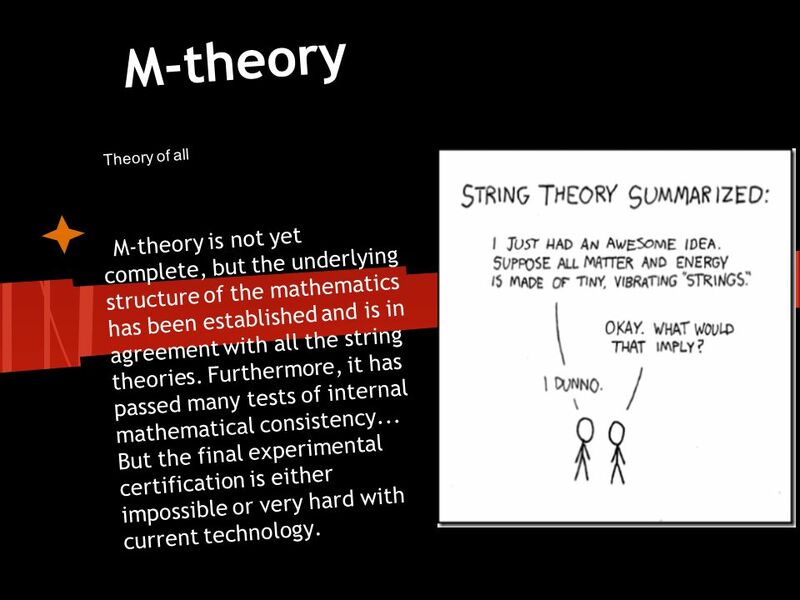 This was called M-theory. 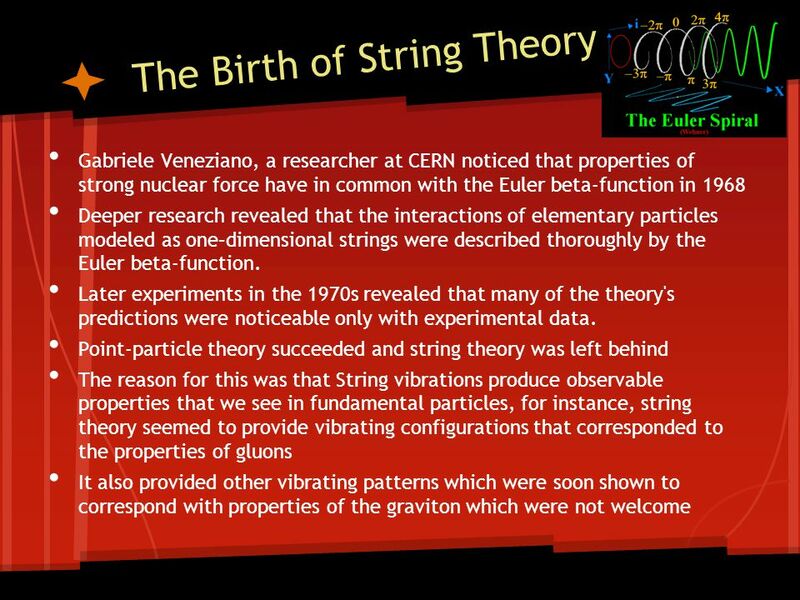 Download ppt "String Theory. 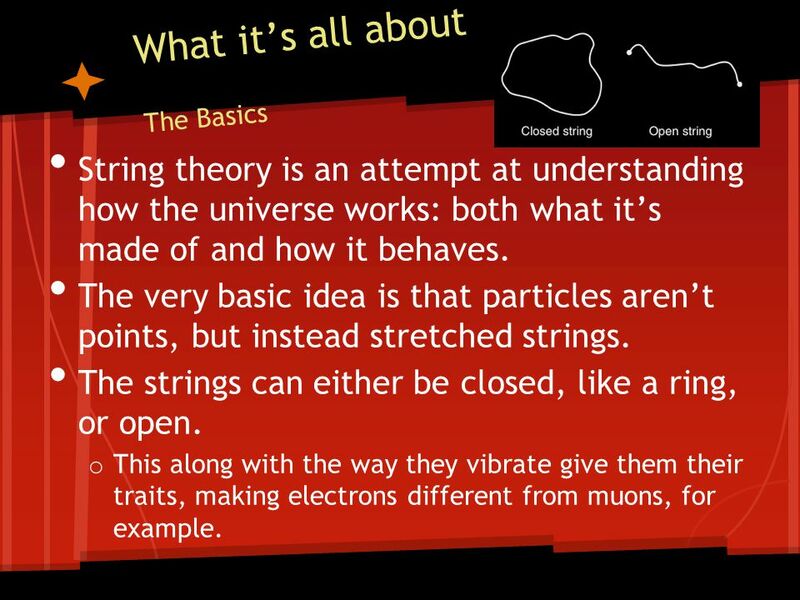 What it’s all about The Basics String theory is an attempt at understanding how the universe works: both what it’s made of and how it behaves." Electron Configuration and New Atomic Model Chapter 4. The Standard Model and Beyond [Secs 17.1 Dunlap]. Possible Unification of Maxwell’s and Einstein’s Equations 1921, Theodor Kaluza: reworked Einstein’s equations to 5 dimensions. Maxwell’s equations emerged. "Now I am become Death, the destroyer of worlds." Robert Oppenheimer after the first test of the atomic bomb. 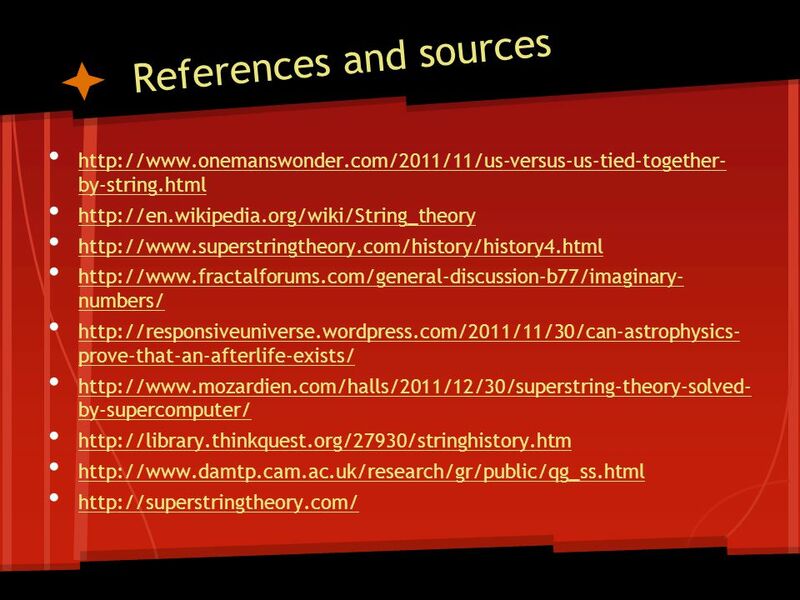 STRING THEORY: CHALLENGES AND PROSPECTS John H. Schwarz October 2008. ATLAS Experiment at CERN. Why Build ATLAS? Before the LHC there was LEP (large electron positron collider) the experiments at LEP had observed the W and. Theory of Everything Is there an end to Physics?. The Elementary Particles Santa Rosa Junior College Physics 4D – Younes Ataiiyan May 11 th 2006 Stephen Ngamate and Thomas Mutunga. 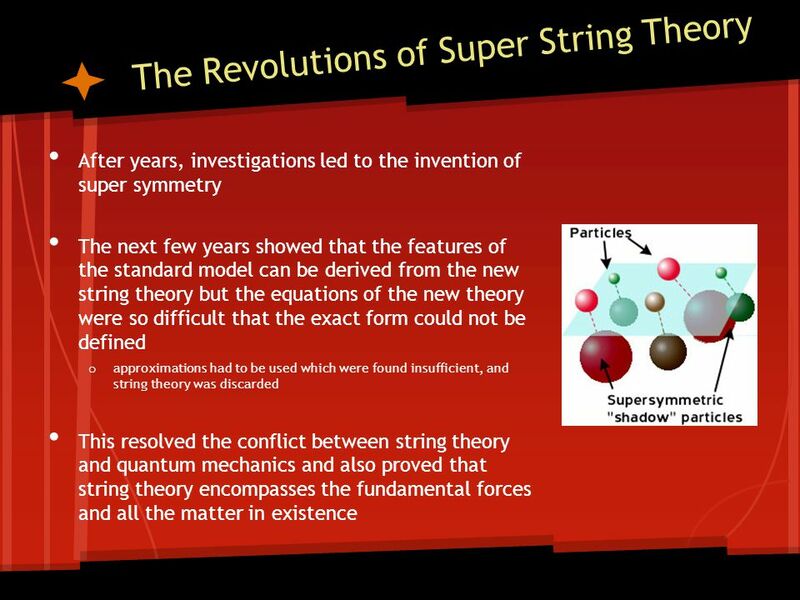 SUPERSTRING THEORY: PAST, PRESENT, AND FUTURE John H. Schwarz PITP Showcase Conference May 13, 2005. 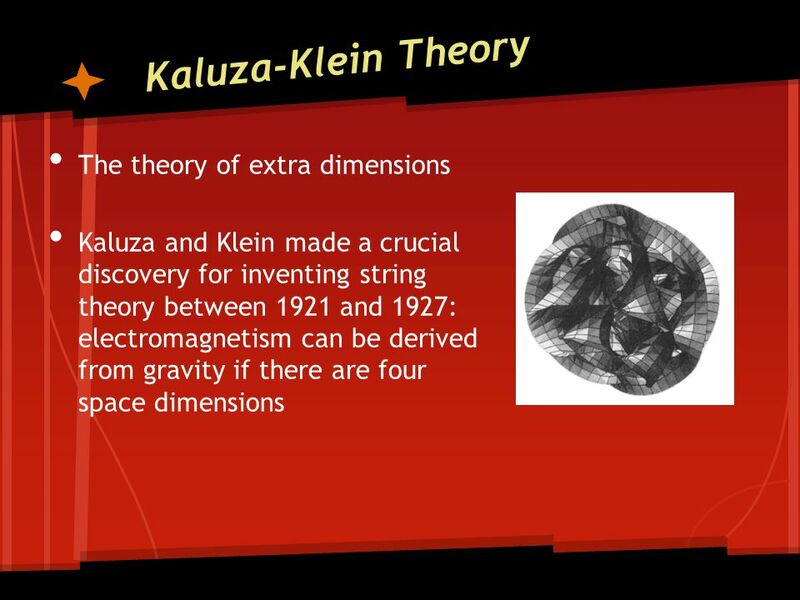 T. K. Ng (HKUST) The Quantum Universe Modern picture of space-time, matter & forces What is reality in relatively and QM? (Twin paradox and Schrodinger. Particle Physics Why do we build particle accelerators? The surface is flat Still flat Oh no its not Big balls cannot detect small bumps.